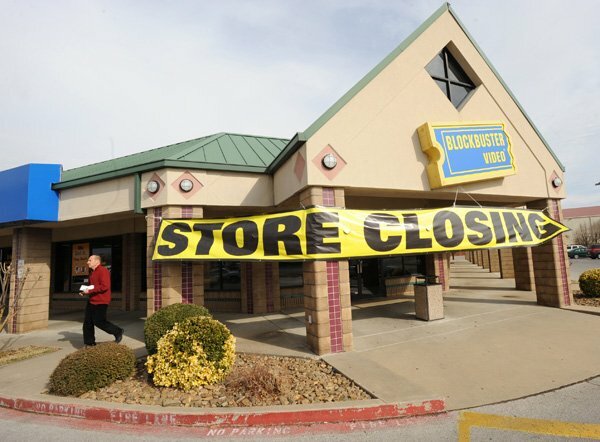 I was driving through my little town on Friday and saw a big yellow banner across my Blockbuster: “STORE CLOSING.” It made me sad, and I hardly ever go there (which, now that I think of it, is probably why they’re closing). The thing is, I’m not a huge fan of the big chains when it comes to anything. I’d prefer to browse the shelves of my local indie bookstore than the Barnes & Noble. But we all know indie stores are struggling, and with the all the big chain bankruptcies over the last few years (think Borders, Circuit City, Tower Records, Hollywood Video) it makes me wonder what retail is going to look like in a few years. In this electronic age, streams of data (think books, music, movies) are available instantly from the convenience of your living room for a few strokes of your keyboard and a mouse click. I can sit here in my footie pajamas and buy almost anything else that the UPS man can deliver in the same manner, as long as I don’t mind waiting a few days for it. So, why would I drag myself to the store, which would entail actually getting dressed? And, speaking of getting dressed…personally, I don’t like to order clothing on-line because I need to try things on, but I know plenty of people who do. I’m starting to think the only thing safe from the ravages of the internet might be perishables. I can order my groceries on-line, but they still come from the local grocer. If the internet kills retail it's because we let it happen. Instead of running to the hardware store, we ordered that new circular saw on-line. Once the stores are gone, will we realize the true convenience was being able to run down the street for that little thing we need right now? Will we be sorry? So, what do you think? 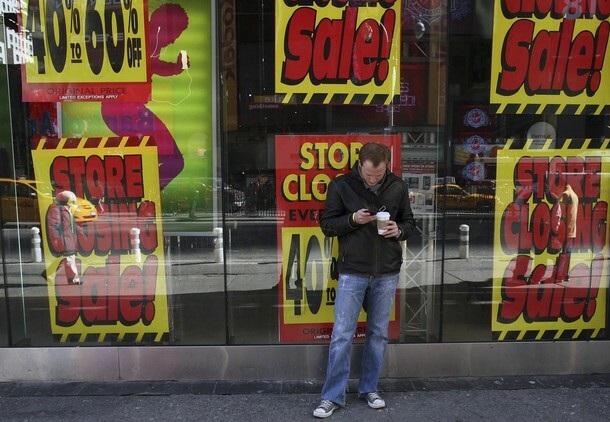 Is the internet going to be responsible for the downfall of traditional retail? Will any stores survive? What will the new retail landscape look like? I rented my first movie from iTunes this weekend and felt kinda guilty about it. But in this case, the only video place within walking distance from me was out of what I wanted to see (its stock has dwindled so much), so I had to go with iTunes. It's kind of a vicious cycle--I'd rather go to a store, but there wasn't one to go to so I went online. Your post renewed my commitment to try to go to brick & mortar retailers first--so thanks. I received some Blockbuster free movie gift cards as a corporate Christmas gift this year, so I've actually been renting movies from there, but after doing this a few times I can see why people prefer Netflix or other options. There are usually multiple people working who are spending their time laughing at Youtube videos since no one is actually in the store and one rental is 5 dollars when I could get a month's worth of Netflix for that price. I think it's all about the money really...if it's more convenient and cheaper online then people will buy it online. I'm even guilty of buying clothes online because maternity clothes can be cheaper there. BUT...I still buy my food at the local retail outlet and I buy baby clothes in person as well, so maybe I'm not so bad? Megan--Often shopping on-line is cheaper, even when you factor in shipping. On-line retailers have a fraction of the overhead of their brick and mortar bretheren. But, if we choose that route consistently, we just need to know that the brick and mortar retailers WILL go out of business. What I miss when I buy things online is interaction with actual human beings. There are lots of reasons to shop in the real world, and human connection is a big one. I like shopping online, but only when I really KNOW what I'm getting. I tend to romanticize my purchases, so I get the box and find the item I ordered was half the size and of poor quality. this doesn't happen in a physical store. Sadly I don't mind the video store closing, but am heartbroken about the bookstores. I always found Blockbusters never had the videos I wanted. Ever. So am not surprised their business model didn't succeed when I can rent it from Amazon or iTunes in minutes. But bookstores are about browsing, sitting, reading, getting recommends. Much nicer at the smaller stores, but even the larger chains have some of the charm. 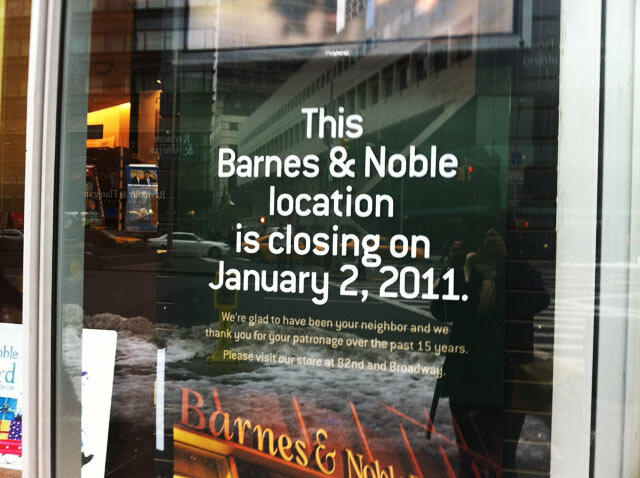 I've just lost my favorite Borders and hope that my favorite b&n doesn't close up. I think b&n has a better online store and with the nook I think they stand a better chance even if some stores are closing. It would be sad to look down Main Street and only see a few restaurants and empty storefronts where businesses once existed. It really upset me when Tower records and books closed. They were started in Sacramento my hometown and were by far my favorite stores. I'm lucky to say my Borders isn't closing but I do order most of my stuff online. I actually don't order much online, if anything really. I want to go to stores to walk around, to try on clothes, see if they fit, and see if the fabric is actually qualitu or not. I'm huge into type of fabric because I sew. Also, I don't want wait for it. LOL. If it's Friday night, I want to take a movie home...now...not in three days. And the pictures are awful online, I think. I hope retail doesn't change because I will be in trouble. Oh Lisa! I am a brick and mortar shop- third generation retail furniture/gift boutique. My family and I all love working in retail and for over 56 years we have worked very hard to build a business and client base. Sadly, customers are driven to 'going out of business sales' and 'cheapest Internet pricing deals'. What they do not realize is a store like ours will close because loyalty to a community is weakening! People are being misled to a 'sale price' but when you add delivery, sales tax, etc...they are paying more! Stores like ours where we own the land and building we do not have the overhead that big box stores have. Unfortunately, customers think they are being savvy buyers when they say they found something on line- good luck! And when your friends come to town and you want to show them around your charming city, you'll have to just take them to Target or Walmart!